Bristol Bay Lodge take care of everything you need. If you would like to travel light you can take full advantage of all the provided fishing tackle, flies and waders which are included within the price. You can also bring your own rods and reels if you prefer. The lodge has you covered if you turn up short or forget anything as it has its own very well stocked fishing tackle shop. This lodge is strategically placed in the unspoiled and untouched surroundings of Alaska’s pristine Wood-Tikchik State Park, and just minutes by floatplane from the rugged Togiak National Wildlife Refuge. The Bristol Bay watershed is a vast area which contains 14 major lakes and connecting river systems. The only way to have access to the entire watershed is by float plane and at Bristol Bay Lodge there are three in legendary DeHavilland Beaver floatplanes. These planes are used to ferry customers through the entire system, where with your guides our riverboats fitted with jet outboards will be waiting for easy accessibility to the most productive fishing spots. Bristol Bay has two main home waters the Agulawok and Agulukpak Rivers which provide some of the region’s most productive and consistent fishing for Rainbow Trout, Arctic Char, Grayling, and Dolly Varden. The Agulawok River is just a short boat ride from the main lodge. The Agulukpak River, which flows between two lakes, is only a few minutes by float plane. These two main rivers also play host to the single largest Sockeye Salmon run anywhere in the world. On average, several million fish return to the Wood-TikChik lakes system and surrounding watershed every year. Other rivers you may fish through the week are the Kanektok, Goodnews, and Togiak rivers which are among the most productive in Alaska for Chinooks, Chum, Sockeye and Coho. After an exhilarating day of fishing from the main lodge, the outside decks are a favourite gathering place for appetizers, cocktails, and weekly barbecues. You can enjoy a hot tub or sauna with a nice glass of wine and feel your worries and stress melt away under a huge wilderness night sky full of stars. During your stay, you will also spend one night at each of the two famous Bristol Bay overnight camps. The lodge maintains exclusive leases on two of the most exceptional fisheries in all of Alaska and it’s on these very different rivers where you’ll experience what Alaska is really about. 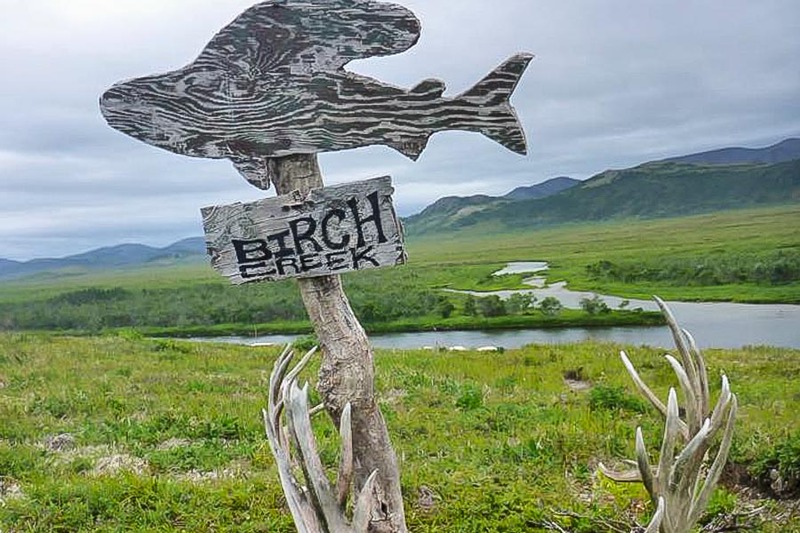 A floatplane trip north and you will be at Birch Creek Camp. This camp is strategically located on a braided and meandering part of the river. In addition to all five species of Pacific Salmon, you’ll find Rainbow Trout, Arctic Grayling, and sea-run Dolly Varden. 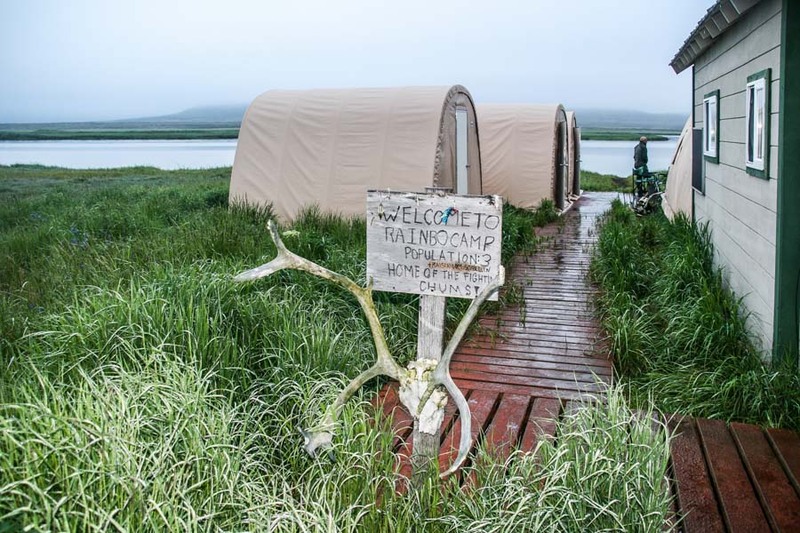 A short flight to the west of the lodge on the tidewater of the Bering Sea is the famous Rainbo Camp. This camp is also strategically placed just below the confluence of two exceptional rivers where you will find huge amounts of the 5 species of Pacific Salmon. At the lodge, we operate a rotation system so each day you get to fish with different guides in different river systems. At the beginning of the week, you will be put into groups of 4 anglers and you will remain in that group of 4 for the entire week. Fishing each day is based on 2 anglers per guide and each evening you will be debriefed by your guide to ensure you know what to expect and are and confident that you are prepared for whatever the next day brings. The wildlife on this trip would be enough for a holiday in its own right, each day you are amongst the wildlife like you are on safari in Alaska. You will see everything from large grizzly Bears, Moose, Elk and Bald Eagles. Fishing in Alaska does not get much better than this and this is what Bristol Bay Lodge is famous for. If you have any questions about our Bristol Bay Salmon Fishing trips you can contact us in the office or request a free brochure. Alternatively, you can view all our freshwater fly fishing holiday destinations. Bristol Bay Lodge caters to up to 26 customers per week. The lodge’s well-appointed facilities offer casual elegant wilderness living filled with creature comforts and an atmosphere of camaraderie. The main lodge houses a completely equipped professional kitchen, a dining room, large living room with bar area, a library and a huge fly tying bench. The famous see-through fireplace is fronted by a panoramic view of Lake Aleknagik. There are eight bedrooms in the main lodge as well as a fully equipped fly and tackle shop. In warm weather, the lodge’s decks are the favourite gathering places for appetizers, cocktails and weekly barbecues. The hot tub and sauna get lots of use after fishing – relaxing sore muscles. Set around the lodge, but private in every regard, are four cedar cabins, often used for small groups or families. Each cabin is different offering its own character, yet all offer scenic views of Lake Aleknagik, slightly fragrant with the scent of cedar as you would expect of true wilderness cabins. The Lodge’s chef will prepare a hearty breakfast and dinner each day. Breakfasts are made to order and include your choice of hot and cold cereals, muffins, bread, fruits, eggs, french toast, pancakes, bacon, sausage, reindeer sausage, juices, and coffee or tea. Your midday meal on the water, unless you prefer otherwise, will be a shore lunch featuring fresh fish, or you can prepare a sandwich at the lodge’s sandwich bar. Dinners always begin with cocktails and appetizers, followed by your choice of two entries. These include steaks, prime rib, crab legs, fresh salmon, halibut, shrimp, chicken, and pork. Your choice of a delicious dessert always compliments these dinners. During your stay you will spend one night at each of our two remote camps, both these camps have fixed beds with fresh linens warm full sized sleeping bags, fleece liners, heaters, running water, and a full-service lavatory. Each camp also has three guests tents that accommodate two fishermen per tent, as well as the main cook tent that is used for serving breakfast and dinner plus a central meeting place for sharing fishing stories, often filled the scene of laughter well into the night. Both camps are staffed with two experienced guides as well as a camp chef to take care of all of your needs. We use a variety of hotels in Anchorage for your overnight stay, from hotels close to the airport to hotels in downtown Anchorage that allow you to see a bit more of Anchorage and even extend your stay. All the hotels that we use are a minimum of 3 stars and will at least include all the basic facilities listed below. If you wish, we can discuss which hotel to use to suit your own personal requirements. Also, for overnight hotels, there is always the option to upgrade to single rooms. Although the fishing has set weeks, we have daily flights departing from the UK, therefore should you wish to either extend your stay with additional days at the beginning or end in Anchorage, the itinerary below can be tailored to suit. On arrival take a taxi to your Anchorage Hotel. Early in the morning take a taxi to Anchorage airport. On arrival Bristol Bay Lodge staff will greet and transfer you to the lodge via road and boat, transfer take around 1.5 hrs. Once you have settled in, its time to go for your first afternoon of fishing. Each day you will depart for a full days fishing either by sea plane or boat. Each guest over the next six days spends one night at Birch Camp and then Rainbo Camp for exclusive fishing. This means that every single day you will be fishing very different locations for all sorts of species. During each day a fresh lunch will be prepared by your guides and eaten on the shore. Guiding is based on 2 anglers to 1 guide. Early in the morning transfer back to Dillingham via boat and car. On arrival take a taxi back to your Anchorage Hotel. Take a taxi back to Anchorage International Airport. Alaska operates a Visa waver programme (VWP); you are required before travel to complete an Electronic System Travel Authorisation (ESTA) online, which is compulsory for all USA Visa Waiver Programme (VWP) travellers before boarding an air or sea carrier to the USA. Dillingham to Lake Aleknagik 40 minutes by road. Lake Aleknagik to Bristol Bay Lodge 40 minutes by large covered boats. You can find Bristol Bay lodge nestled in the edge of the Wood-Tikchik State Park. During your stay with at Bristol Bay Lodge, you will fish a different location each day and have the opportunity to catch every species of fish available to you during any given week. Each evening you’ll be informed of your next day’s fishing adventure by an experienced fishing guide. Every aspect of the coming day will be explained. You will be fully informed and confident that you are prepared for whatever the next day brings. Bristol Bay Lodge has six different and spectacular fishing destinations. Each fishery you visit will be unique and memorable. Four of these fisheries will be utilized in your two overnight camp experiences and two will be fished from the lodge as day fisheries. Two of Alaska’s most renowned fisheries, the Agulawok and Agulukpak Rivers are ‘home-waters’ for the Bristol Bay Lodge. These fisheries provide some of the region’s most productive and consistent fishing for Rainbow Trout, Arctic Char, Grayling and Dolly Varden. Additionally, these rivers are host to one of the largest Sockeye Salmon runs anywhere in the world. On average, several million Sockeye Salmon return to the Wood-Tikchik lake system each year, and most pass through these two rivers. The first Sockeye Salmon are usually caught around the 4th of July. When the time is right, it’s not unusual to catch limits of these noble fish before lunch and spend the afternoon pursuing Rainbow Trout, Arctic Char and Grayling. Bristol Bay Lodge maintains exclusive leases on two of the most exceptional fisheries in all of Western Alaska and it’s on these very different rivers where you’ll spend two nights. The overnight experiences at the two camps are possibly the best wilderness experience in Alaska. They are often remembered as the highlights in the trip. Located northwest of the lodge and north of the tree line is Birch Creek Camp. 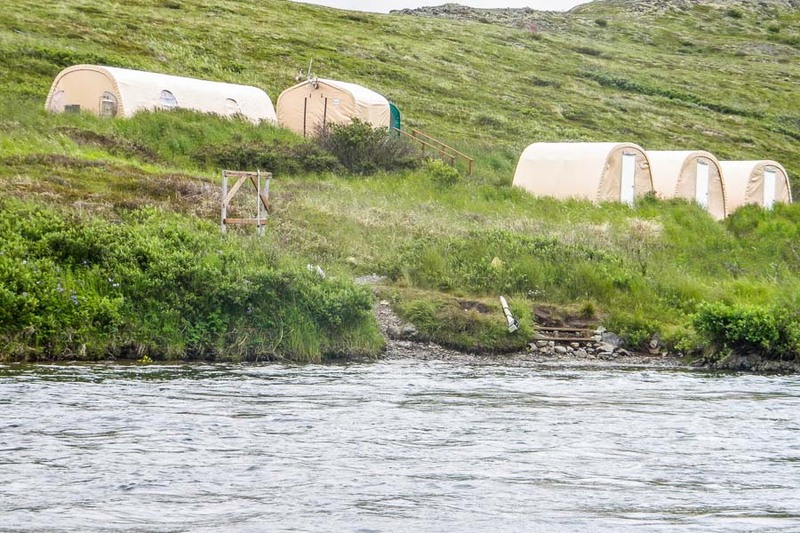 This camp is strategically located on a braided and meandering tundra stream. In addition to all five species of Pacific salmon, you’ll find marauding rainbow trout, enormous arctic grayling and an incredible population of sea-run Dolly Varden. 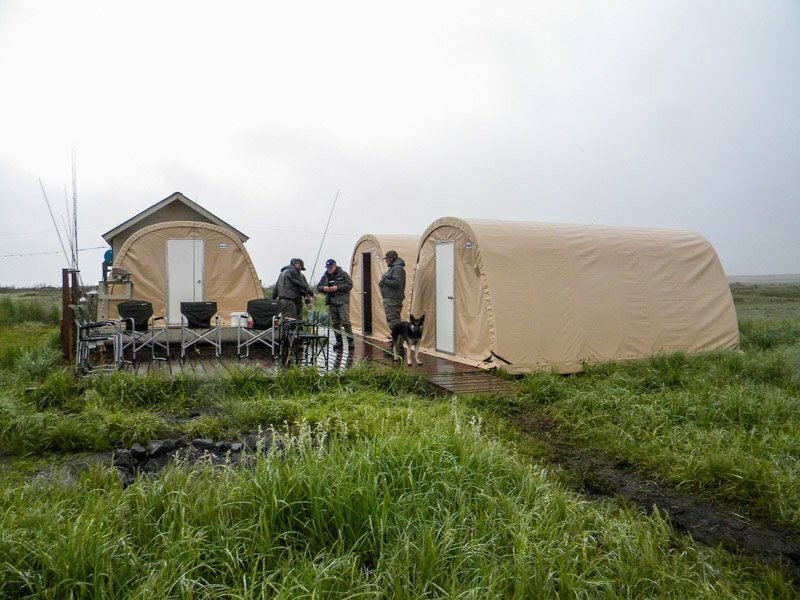 Directly west of the Salmon Fishing Bristol Bay Lodge, located below the confluence of two exceptional rivers and on the tidewater of the Bering Sea, is Rainbo Camp. 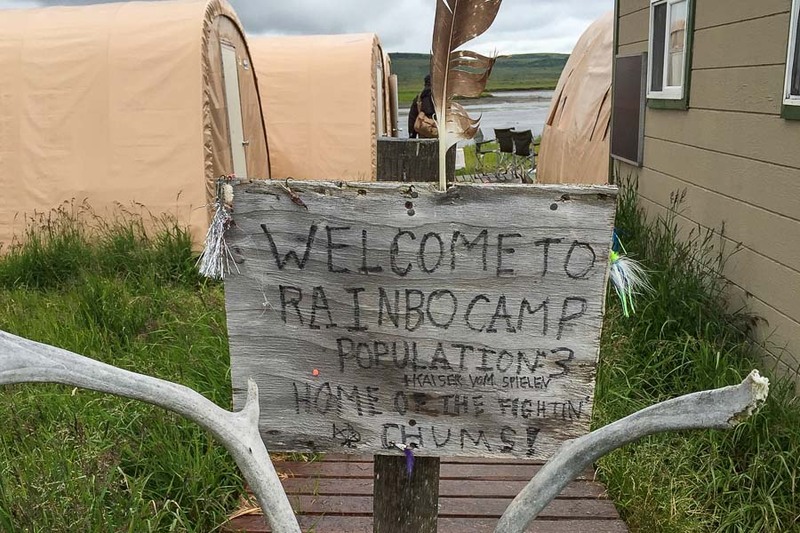 Those who have spent time at Rainbo camp lovingly describe it as “the end of the earth”, a place where the wind in the grass brings whispers of ancient times. 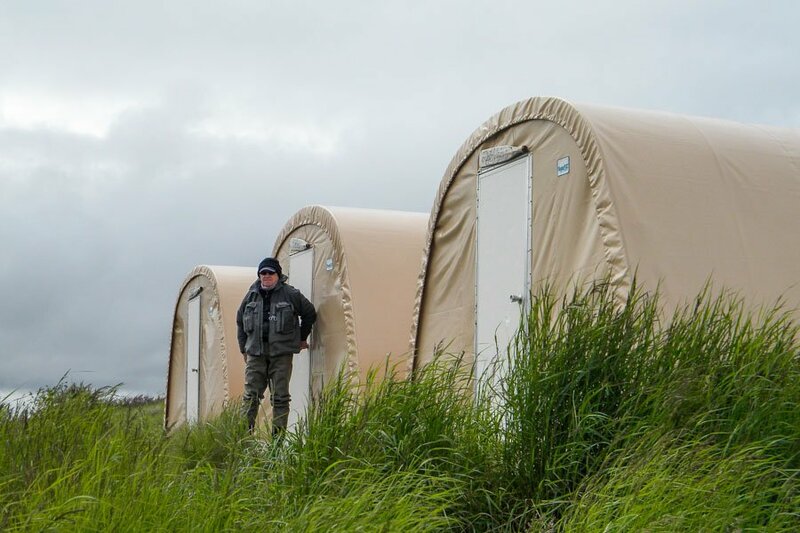 The camp is located on tidal water, at the edge of the Bering Sea. Every tide brings with it the promise of a fresh run of salmon just minutes from the saltwater. A trip to one of our remote overnight camps begins like every other day at the lodge. After breakfast you will depart from the dock at 8:00 AM in one of our three de Havilland Beavers. 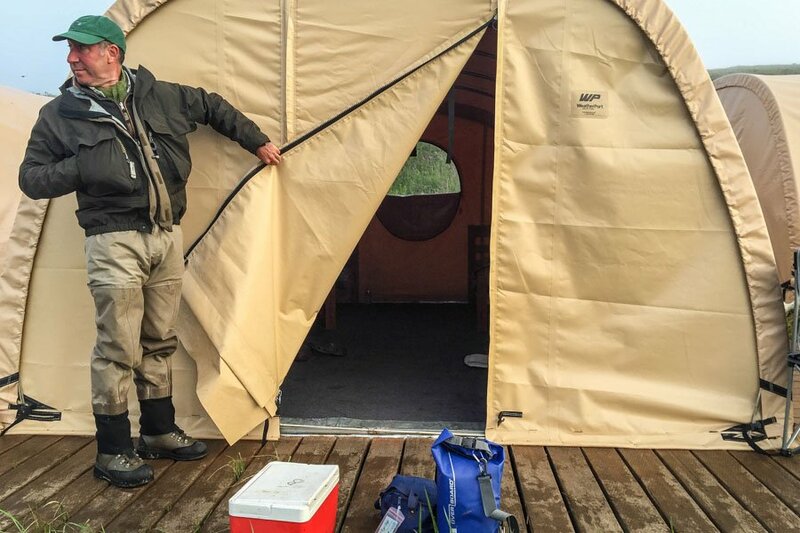 You’ll enjoy a scenic 30-minute flight and land at one of our two spike camps on the Togiak River, where you will be met by fishing guides who live on the water they fish. Both of our camps on the Togiak River offer fishing for all five species of Pacific Salmon, Rainbow Trout, and a prolific run of anadromous Dolly Varden. Our camp on the upper Togiak River is world-renown for its Dolly Varden and Silver Salmon and at times the fishing for Rainbow Trout can be extraordinary. 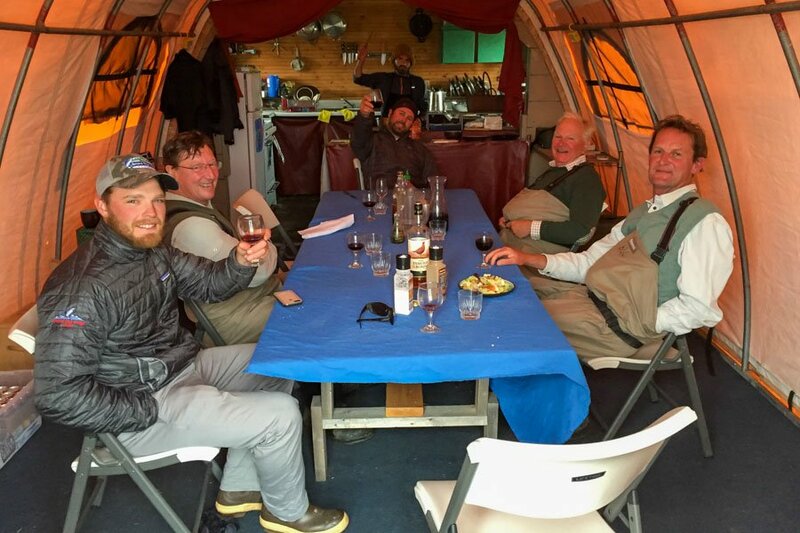 After a day of fishing on the Togiak, you will begin the final leg of your journey to one of the overnight camps, arriving in the late afternoon. On the short walk to your camp, it’s easy to be overwhelmed by the stunning beauty and the placid serenity inherent to remote Alaska. When you arrive at the camp, you’ll be made comfortable, enjoy a light snack and gear-up for your next fishing adventure. You’ll fish until evening, enjoy dinner with your friends and then return to the river and fish as late as you’d like. A comfortable night’s sleep and a hearty breakfast the next morning will prepare you for the next full day of fishing. You will return to the lodge the next evening at 5:30 PM. You have direct access to your experienced fishing guide during your entire trip, so you can rest assured that you will be taken great care of and all questions will be answered. While these camps may seem to be on the very edge of the earth, they are well appointed, comfortable and safe. We make sure every aspect of your Alaska fishing trip is something you will remember forever. Both camps have three private, carpeted and heated guest tents with two fixed beds. On these beds, you’ll find warm, full-sized sleeping bags with fleece liners. The camps have running water, with a full-service lavatory and shower. In addition to the three guest tents, each camp also has a main cook tent that is used for serving breakfast and dinner. It also serves as a central meeting place for the beginning and end of each day. This is where you’ll share fishing stories and laughter often late into the night. The camps are staffed with two experienced guides as well as a camp chef to take care of all of your needs. Both camps have state of the art satellite phones should communication with the lodge be necessary. The travel time depends on where you are going to fish and is mainly taken up by just flights times from Bristol Bay Lodge. On arrival at each location, there will be boats waiting to take you both up and down the stream from your landing point. Most of the travelling is done within 40 mins then you will be fishing. Depending on what time of year you join us at Bristol Bay Lodge will depend on what species will be available in the rivers, so please make sure you check out the species information on this tour. Throughout the year King Salmon, Rainbow Trout, Sockeye, Chum and Silver Salmon are all on the main menu. Other species include Northern Pike, Dolly Varden and Grayling. The amount of fish you will catch at the Salmon Fishing Bristol Bay Lodge will depend on the target species and the time of the year you are fishing with us. Each species has a season but also a peak period where the run is greater. It is best to talk to us about what you wish to achieve from your trip and we can then advise what the best weeks would be to suit you. Bristol Bay Lodge is conducted in many different ways, for a customer wanting to target the big Kings & Chum Salmon it is best to swing large flies with Spey rods. For the smaller Salmon, you can fish with shorter lighter rods like 12ft switch rods which make great both single and double Spey fishing. You can then even fish with 5# single handed rods with drys for the many Trout and Grayling. All of the guides at Bristol Bay speak very good English. Anyone who wants to gets lots of action and catch lots of fish. You can come as either an experienced angler or as a beginner, we cater for all abilities. The guides like nothing more than teaching people and sharing their passion for catching these fish in this amazing environment. If you are far more experienced and only want to chase the specimen fish we also cater for that. The physical demands of Bristol Bay Lodge are not challenging. You should expect to get in and out of small planes and boats on most days with some wading and short hikes. Again this really depends on your targets for your trip. The season starts in June and runs through to September. Talk to our experienced staff in the office and they will advise you from experience what are the best weeks for you to meet what you wish to catch. To get to the Bristol Bay Lodge you will fly to Anchorage in Alaska. After an overnight stay, it’s just a short flight to Dillingham before you are then transferred the rest of the way by boat up the lake to the lodge. The Bristol Bay Lodge has a professionally equipped kitchen, dining room, a great room featuring a fireplace, bar, library and large well-furnished fly tying bench. There is also a fully equipped fly and tackle shop where any angler can be completely outfitted. In warm weather, the lodge’s decks are a favourite gathering place for appetizers, cocktails and the weekly barbecues. As waves gently break against the shore and fish leap from the blue waters, you can relax in the hot tub or sauna after a long day of fishing. You can keep your waders and rain jackets cosy and dry in the warming house. In addition to the eight spacious bedrooms in the main lodge, there are four comfortable and private cabins set around the grounds. These cedar cabins are often used for small groups or families. Each has its own character and offers the kind of scenic view of Lake Aleknagik. The food is excellent; it is in true Alaskan style with plenty of traditional meat dishes! You will all eat a cooked breakfast before you head out for the day, your guide will bring along a picnic for you to have by the riverbank whilst you are fishing. Evening meals are eaten at the dining table and are three courses. Bristol Bay Lodge is the perfect location for anyone who just wishes to turn up with a bag of clothes, everything else can be provided. You are welcome to bring your own tackle or you can use all the necessary lines, flies, waders, boots, rods and reels all for free from the lodge. The lodge does have internet but your cell phone will not have signal. The lodge does have a phone you can use if needed. As the lodge sits on the edge of the lake there is not too much else to do apart from the fantastic fishing. Do You Need A new Pair Of Waders? Stephen thank you for your customer review. Glad you really enjoyed the holiday and it was a shame about all the delays and cancelled flights on the way out. Unfortunately sometime these things happen with airlines as planes do break down. Brilliant trip! Best yet with plenty of Kings! Flight delayed from Heathrow, but were looked after very well. Paid for single accommodation, but was not bothered as i fished alone all week. Second hosted trip, but as yet to fish with host, however, i had my own guide for the week, so i had a real personal touch. A fantastic trip, fully recommended! I have tried to call you a couple of times but unfortunately keep missing each other. Just like to say thanks again for your continued custom. I must say it was my first time to Alaska and the hosted trip was first class regarding the fishing I have been to Scotland 6 times and never caught a fish. Not the case in Alaska plenty of salmon. Thank you for your custom and also a huge thank you for you customer feedback as they are all very important to us. So glad you caught lots of Salmon as it does open up your eyes to a totally different form of fly fishing for Salmon. A great trip all round as always and great company. Thanks to Sportquest again for everything. If I had one criticism it would be about the standard of fishing tackle (Rods n Reels) at the lodge. They are not of the highest of standards as you would expect from such a high class lodge. My suggestion is if you like top quality rods n reels take your own. If you a new to this the lodge equipment will be ok, but for more experienced anglers better and faster rods would allow you to fish much better. Thank you for the feedback as ever and also taking the time to chat to me on the telephone. I have noted your comments about tackle and will be passing these on to the lodge today. I think it is a very valid point. Thank you for your continued custom as your support is always appreciated. I hope we can be of assistance again soon and you never know I might just get you on one of my hosted fishing trips, so we can do some fishing together. A brief note to thank you for the trip of a lifetime - it was everything I thought it would be and more. All the staff at Bristol Bay are hard working and enthusiastic and really go out of their way to make sure you enjoy your holiday - they genuinely make you feel special which is really nice. The accommodation is very comfortable, even at the outcamps, and the main lodge couldn't be nicer. The food is great everywhere, particularly considering the basic cooking facilities at the outcamps. The scenery, especially from the air, is awesome - as is the wildlife. All in all, an unforgettable holiday and I shall certainly be booking a second visit at some point! Just a minor gripe : a 5 hour transfer (that turned into 6 hours) in Frankfurt was unnecessary and having to pay for a second bag in Anchorage, despite 2 bags being included on our tickets, was a little underhand. Thank you for such a detailed and glowing feedback and it is very much appreciated. I can remember saying to you that even if you did not catch any fish that this trip is an experience in its own right. Having said that I knew you would all catch lots of Salmon, plus lots of other species as the BBL never lets us down. Also congratulations on the 4 big kings, they sure do fight hard. We are not sure why some customers had issues with a 2nd bag on the return journey as it clearly sates on the paperwork that we received from Condor Air that customers booked on Premium Economy has 2 free checked bags. So sorry for this but as mentioned Condor is not an airline we use on a regular basis, only when customers request them. On contacting Condor they said on the telephone that yes Premium Economy customers receive 2 free checked bags, but this message does not seem to get to the staff at the check in desks. I think moving forward we will advise all customers that you only receive 1 free checked bag and then if they have an additional one and they do not get charged it will be a bonus. What a fantastic trip yet again. Ideally I would like 2 days at Rainbow, 2 days at Birch and 2 days on Togiak River, but I am sure all fishermen would like this option. I do not enjoy to much the fishing on the wok for Sockeye Salmon. It would be nice if there was opportunity to fish more with the double handed rod than just a couple of places. Thanks to everyone from staff in the office to guides on the bank. Thank you for posting back the feedback form, still would love to catch up on the telephone at some stage. I would love to do that itinerary you mentioned as you have just picked the top fishing spots out of the weeks itinerary. I agree with you I am not a massive lover of the Pac and Wok but 90% of customers love them for a change in fishing and pace. Plus it gives them the chance to target the huge Rainbows, chars and dollies etc. Thank you again for your continued business and I look forward in looking after you again. What a great holiday, good company, wonderful fishing for 6 different species. First class guides, good food. I caught the biggest fish of my life a 40" inch King between 38 to 40LB what an amazing fight. Thanks to everyone and Sportquest for all the organising & managing. It was great to catch up with you after your trip. Very happy that everyone had a great time, sounds like everyone caught everything and more than they had been expecting. I have sent you a separate e-mail if you can forward the group pictures to me it will be very much appreciated. Just a great fishing holiday which was the second year with my son to Alaska at 38 years old. Really appreciated the whole experience as it is an idea Dad & Lad holidays for 5.5 salmon fishing days. As the Salmon fishing was so good we caught so many fish that on the last day we spent the whole day Trout Fishing and had a farther & son competition. I did not quite make landing 100 fish but I did manage to beat the boy with a 7 fish lead, so very happy. Great service from Sportquest Holidays as normal. It was great talking to you and catching up with you after your trip. Love the story about the fishing match and glad to see that you have not lost your winning touch. I will look forward to Johns feedback and also a good selection of your pictures. Peter, just to let you know we had great trip thank you. It was better than last year, which is partly due to returning for a second time, I believe you are more prepared and know what to expect. Also this year the guiding was first class, some of the new guides from last year have really improved. In total I have around 35 Salmon, plus tons of Trout, Char and Grayling. The ONLY negative point on the whole trip was British Airways, who first tried to bump me down from Club to WTP, then the cabin service was poor, then to top it all off the damaged my bags as they did last year. I know you have no control over them as nobody does, therefore I scored the flights as poor. Thank you for calling me back, it was really nice catching up with you after you returned from your trip. So happy that you had such a good time and I agree with you, I always think its better to return for a second time. It does not matter how much pre trip advice you receive, there is nothing like going back and feeling ready for it with your own experience. It was as always a pleasure to assist you with your travel arraignments and we all look forward in assisting you again soon. Last year at BBL was my first ever fly fishing experience. The second year was even better. I am working out how to make the transition from a "Trip of a lifetime" to an annual event. Many thanks to Robert and all the Sportquest staff for their help. everything from casting sessions to organising the logistics. It was nice to catch up with you on the telephone and so nice to hear that you and everyone else all had a great time. Its a destination that the memories last forever. Love to see any pictures when you have time to review them, just feel free to e-mail them through to use. The whole trip was great, the staff at BBL were amazing. great new hosts, cooks and nice to see old faces again with the guides. We also liked the flights with Condor as the route feels more direct and we arrive at Anchorage at a better time of day. Thanks for talking to me on the telephone it is always a pleasure listening to customers who have returned for a great trip. As you know BBL has always provided good service and with the new lodge staff & cooks combined with the experienced guides BBL is back on top form. I will look forward in you e-mailing me some of these pictures which I will share on our website. Again thank you for your custom, look forward in doing it all again soon. We arrived via Frankfurt and over the North Pole which was spectacular Condor air is not the best but suited our timetable which gave my 2 "newboys" a chance to see Anchorage which is always changing and interesting we obviously took them to marvel at the huge sport supermarkets which still amaze me with millions of £ worth of stock! The other half of the group came later via Seattle which surprised everyone by the speed of clearing customs. The new private charter to Dillingham ran like clockwork . We then started the final transport via bus and boat, the excitement was tangible now. The Lodge came into sight after 20 miles of high speed boat trip to reveal several improvements a new dock, new roofs all around. I have been going to BBL for 14 years and without doubt this was the best yet. Good Staff, good food and amazing fishing. it was great catching up with you on the telephone, thanks again for hosting the trip, it sounds like another amazing adventure. I am about to start calling everyone now they have all had time to settle back home. Lets look at doing it again next year. The holiday was brilliant and very memorable â€“ exceeding expectations â€“ which were in any case very high. Phil has been encouraging Fergus and myself to do this for many years and we finally got organised to do it. Great decision and thanks to Phil. Going on â€œPhilâ€™s weekâ€ was an excellent choice for us â€“ both to hit the maximum variety of fish and fishing techniques and also to have Phil to look after us in Anchorage and to meet with him and rest of his team at the lodge throughout the holiday. Travelling as a group of 4 good friends was also perfect â€“ as Phil had advised â€“ so we went everywhere together as a four and shared boats in pairs. Some risk if you went on your own or even as a two. There were two things in particular that exceeded expectations so dramatically for me. The first was the stunning beauty of the scenery, rivers and variety of remote wilderness we could access by plane. I had not expected this at all. I thought we would get great fishing but most likely in rather flat, exposed and featureless rivers. Maybe this was fault of Philâ€™s photos which of course concentrated on large fish! The camps were a highlight. We also saw exceptional wild life â€“ bears jumping on fish, eagles of many types taking fish from the river etc. This all converted the holiday from simply catching large numbers to a real treat and adventure. The second was the great variety of fish, fishing techniques, rivers and types of water, changing every day. Always learning something new and enjoying trying it out and always catching fish with it. Sticking with one or two only would have much diminished the richness of the experience. Of course we caught lots of fish â€“ 296 between the four of us â€“ but it was the striking and playing of such energetic fish with small rods that stood out for me â€“ though with different techniques from Atlantics which took a little to adjust to. I think we lost 2-3 fish to every one we landed. We broke 2 rods and lost at least 2 lines to energetic fish. If I was to be picky and try to find a fault it would only be that the fly casting required was not very skilful or pleasurable when compared with Atlantics. No problems with mosquitos â€“ a real bonus as I had expected this to be a major irritation. Steve runs an exceptional operation. Very well disciplined logistics to move everyone and all their kit around every day, charming staff in the Lodge â€“ notably Genessa, Dawson, Christina and Rose â€“ and some great guides. Buzz on the Togiak and Wok and Tyler and Joe at Rainbo were outstanding for me. Professional, knowledgeable, ever-helpful, and good company. The great beard of Buzz will be remembered. Our day of â€œhoppingâ€ by plane with Dan - and his delicious tartar sauce on the bank of the Togiak â€“ was a highlight and very memorable too. It was also entertaining to meet some of the other American guests â€“ particularly a couple of guys from South Carolina with great turns of phrase, unapologetic political incorrectness and with views way to the right of anything! (They offered to give us Obama, Clinton â€“ and anyone else in the democrats we wanted - in exchange for Cameron. Donâ€™t think they quite got it on how far left Cameron is). The Lodge was perfect for us â€“ not grand but comfortable, great food, charming staff and nice touches like the drinks reception on the jetty at the end of a day. 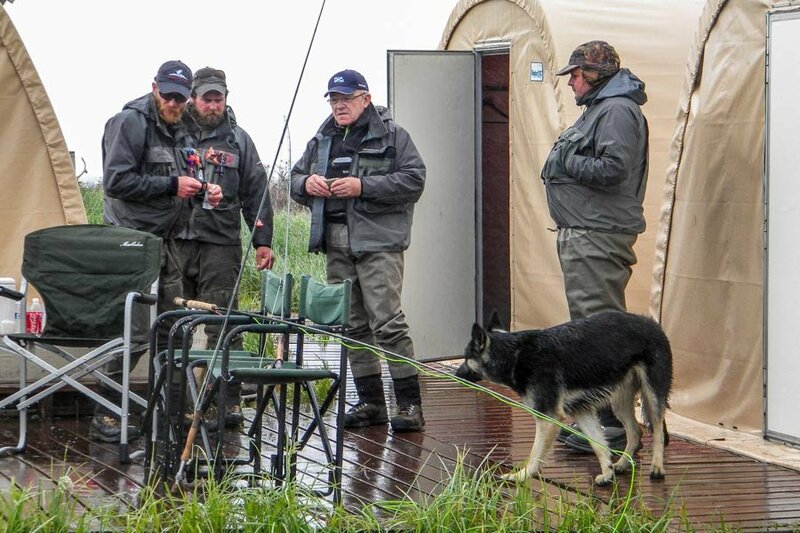 The camps were exceptional - really giving the feeling of being out in the wilderness and with much of the best fishing â€“ we were lucky to be shut-in for a second day at Birch. Any attempt to smarten these up should be resisted. Brian the cook at Birch was charming, interesting - and a good cook. Melâ€™s admin and instruction notes etc from Sportquest were very good. Is there anything we could have changed to make it even betterâ€¦â€¦â€¦â€¦..? 1. Alaskan airlines were catastrophic. They lost Fergusâ€™ and my bookings on the return flight and had to put us on a later flight with tight turn around to catch BA from Seattle. Both our bags missed the London flight and had to be loaded the following day. The 25lb of frozen salmon the Lodge had packed up for each of us took 3 extra days to get home and had to be tipped in the bin. My other bag was mis-loaded at Seattle and went to Denver on another Alaskan Airlines flight â€“ it did finally get home but not without much anxiety of losing all my photographs! Some of the exhilaration of arriving home from such a great holiday was lost with the anxiety of chasing down delayed and lost baggage. 2. Better shower â€“ or better still hot bath â€“ in chalet at the lodge would have been nice. 3. 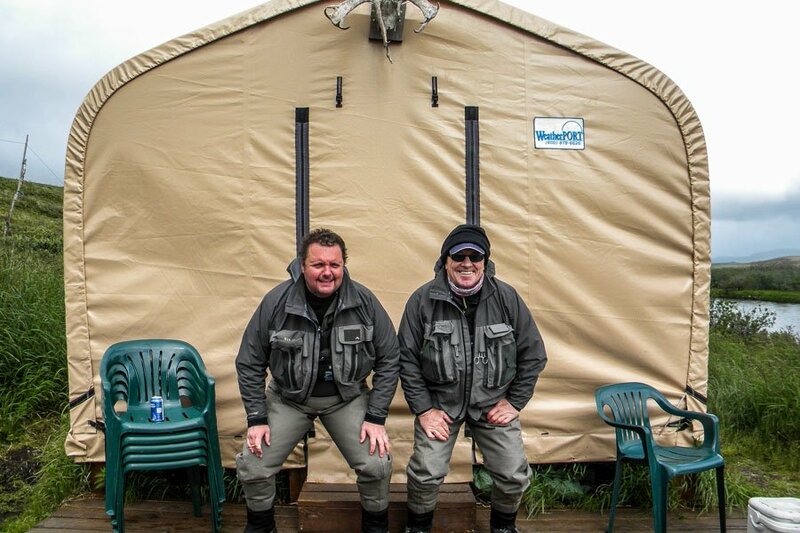 We chose to make use entirely of the lodges waders, tackle etc â€“ a great service to avoid carrying all oneâ€™s own stuff. Only a little surprised for such a well-run organisation that on two occasions, or was it three, fish were lost through line breaking at the backing, the backing breaking or the backing simply running free off the end of the reel. Reels, Waders and boots were good. 4. Hotel in Anchorage not great â€“ noisy at night and no proper breakfast â€“ but ok in my view so not a serious problem. 5. We were probably a touch late on the King salmon run and only caught one really big fish â€“ Fergus got a 45lb fish in first 10mins on Togiak. May be an excuse for another trip! We have of course buckets of photos and will be putting together an album. I am sure there are some we would happily share which might be of use for you. I can get together with Fergus and send you some. Wow what a very nice detailed report it was a pleasure to read and yes sure all these comments / customer reviews are always passed on to the lodge and staff. I am so glad that you all listened to Phil and enjoyed the trip. I have been there many times myself so I know exactly what you are talking about and I am so glad that you and your group really got in to the the feel of the whole operation. Thanks for the points for improvement we will look at these and discuss. In relation with Alaskan Airlines, I am not sure what went on this year with this trip. Considering the amount of anglers we send to Alaska each year this is the first time anything like this has happened. Having said that it seems to be going on all over the world this year as it seems a record year of flight delays, missed connections etc. So much so we are upping up our minimum connection times for all airports in the USA. Arrive at a USA airport at the same time as a couple of other large international flights resulting in huge queues at immigration and customs makes it impossible to make connections. The other options are looking at getting people there with connections outside the USA. I will look forward to seeing and sharing some of your pictures, plus helping you all again sometime on some exotic adventure travels. Thanks for your custom and support it is much appreciated. This was my 5th trip to Bristol Bay Lodge and as always the fishing was great as was the service we received at the lodge. The accommodation at the lodge was very good, but the staff are the people that make the whole thing work so well. Nothing is ever to much trouble and they go out of their way to make your stay a great experience. The fishing guides are brilliant and again they do everything they can to make sure you catch fish and enjoy the whole experience of fishing on great rivers and in fantastic surroundings and wonderful scenery. I had a great weeks fishing and hope to be back next year. Thanks for your feedback and continued feedback its is always appreciated. I agree with you the lodge staff do work hard to ensure you all have a great time and as always we will make sure all your comments are passed on to everyone. The trip was a contrast of two halfâ€™s, the first part of the week was very disorganised and it all depended what guides you got. Some of the guides where very very good, some of the new guides were terrible. Unfortunately for the first 2.5 days we did not get to fish what we wanted to fish for. The second half of the week once we made it clear we only wanted to fly fish and swing flies we caught lots of Salmon. Eric Thank you for taking the time to talk to me on the phone. Sorry about the start of your week as there was some confusion. Also I know the lodge just lost two of its regular guides as they have hurt themselves and need to leave the lodge for treatment. I am glad however that the second half of the week you all got to fish and catch what you wished for. Obviously sometimes these things happen that are out of our control. However if you would consider returning again we will do you an extra special deal. A truly wonderful fishing experience. If you are frustrated from catching near to zero in Scottish rivers then look no further than Bristol Bay Lodge. Steve and Janessa with all their attentive staff make your stay comfortable and extremely well organised. The fishing guides are all first class but remember to ask and listen to how you should fish the different rivers and salmon. The techniques are different and fascinating to learn and once you get them bang on,the results can be very productive. I managed to catch over a hundred fish in the 6 and half days fishing and our group caught 12 different species of fish including a tiny flounder and gudgeon!! The Old Anchorage hotel is noisy. Ear plugs a must and try to book rooms at the back. I lost my luggage for 3 days on my return flight so that all the lovely salmon that BBL had packed up for me went bad and when I eventually got my luggage back I had to throw it all away. Our host Phil Barker was right about everything and the whole trip was even better than he described. Thanks Phil. It was so nice to talk to you on the telephone as I could still hear the excitement in your voice about your trip. What an amazing result you and your team had. We have already made note and will in the future book rooms at the rear of the hotel for everyone on the trip while staying in Anchorage. Sorry to hear of the hassle with Alaskan Airlines on the return trip, out of all the customers we have sent to Alaska over these last few years thats the first time I know of luggage going missing on the return trip. The good news is they eventually returned your luggage to you all, however it was far to late for the box of Salmon you all had. Thank you also for your kind words about our guide Phil Barker it is much appreciated as he does work hard in trying to make everyone have a great time. Thank you for your custom as it is much appreciated I look forward in helping you all again soon. Best: arrangements at Bristol Bay Lodge to get to and from fishing. Staff and guides gave excellent service. Tip for anyone staying at the Historic Anchorage, request rooms at the back of the hotel as they are much quieter. Thanks for your feedback and taking the time to chat on the phone about your trip. I am glad I was right and that you enjoyed it. I could just see you fishing there and laughing while battling Salmon. Thanks for the tip on the rooms in Anchorage, we will action this from know on for all guests. Hope to have you return with a few friends soon. Bristol bay is a very comfortable and well run lodge with two outdoor camps which are adequate. I was not aware that we would be fishing with single handed rods as well as double handed rods. I should have spoken to Robbert more about the trip beforehand. The lodge does struggle with getting and retaining decent guides to the river which for some 1st timers is essential. The guidance they give is very poor, one time we went to the river and only told we could do spinning very unenjoyable, but the next time we had perfect fly water. All in all it was a great adventure but with a bit more detail before we travelled could have been an extra ordinary fishing trip. We were with Robert Sheriff party who knows the ropes but i did struggle withe the fishing concepts. Thank you for taking the time to talk to me on the telephone and for taking the time to complete your customer feedback. It was a shame that we did not get the chance to talk before your trip, as I would have made it clear what to expect and not expect from the trip. Yes we know of an issue on your week with guides. Its a real shame for as you said guides make or break your holiday and unfortunately the lodge lost 2 guides on your week due to injuries. This is something we will have to look in to for future years and have a more reliable back up if such a thing should happen. But I am sure you will understand that this is the first time something like this has happened in many many years. As mentioned if you ever fancy doing another trip to any of our destinations please come back to me personally as I will make sure we give you a special deal as we like ALL customers to be 100% happy. Great adventure the flights in float planes over the Tundra are stunning, the fishing is incredible for the most part although the Pak fished well on one day and poorly on the second day. I guess that's fishing! The flights from UK are long but I can still get to Anchorage quicker than the North of Scotland! The holiday works out cheaper than a week on for example The Helmsdale and price per fish caught bares no comparison .I personally lost count of Salmon caught but around 30 would be fair not to mention Dolly varden big Grayling over 2 lbs and Rainbows up to 4 lbs ! The lodge is homely the out camps remarkable for what they are with 2 guides and a chef for 4 rods Having said that one camp is a little primitive but way better than a tent! The staff are very good with only one guide below standard the lodge staff very helpful and friendly. The transport is excellent with fast boats and very good aircraft! and I believe 27 staff for 24 rods! The Hotel in Anchorage is quiet and adequate I have stayed at better downtown but the noise of trains and traffic is relentless all night. I wish there was a flight out on Saturday afternoon as once you head for home its best to keep going! I think 2 nights before the adventure would be better as Anchorage has so much to offer. Thanks for such a great feedback and I am happy that Bristol Bay Lodge again lived up to expectations. Some customers like to get in and then out again as quick as possible but we agree with you that its better to have a few nights in Anchorage to break the journey up, plus as you said there is so much to see and do its a shame to miss it. I look forward in managing the group again for 2016 and will chat to you again soon. Bristol bay lodge is in a wonderful setting, but a fair way to go. Some of the rooms are a bit tired, and some of the meals were not as we would have expected. The guides were helpful and on the whole knew what they were doing, However in certain areas it was vital to have the right guide if you wished to have the best fishing, They were a bit stuck in their ways, and so on the first couple of days until we had worked it out we fished methods we did not particularly enjoy. The rods and reels provided were fine, however they only had a basic tip, those who had their own tips, enjoyed far more success as the flies could be presented at the right depth, without adding lead weights. I had expected to fish mainly for salmon with the fly, but as it turned out I had in order, I days mainly salmon fishing, followed by half a day throwing weighted fly lines for sockeye, and half a day pike (1-3lbs), 1 day trout and grayling and pike fishing, I day spinning with eggs for king salmon, I day fly fishing for salmon and to finish half a day fly fishing for salmon and half a day trout fishing. So in total only 2.5 days fly fishing for salmon. One other party had 5 days fly fishing for salmon. I have to say despite a few problems with some bad weather, and despite the lack of fly fishing for salmon, I did enjoy the trip, the pilots and float planes were excellent, the scenery stunning it was an amazing experience, I would go back but only on the guarantee I only did one days fishing on the pak and one on the wok. Although the lodge provides fly fishing tackle I think it is far better to take your own rods and reels and lines. Thanks for taking the time to both complete the feedback form and also talking to me on the telephone about your trip. Itâ€™s a real shame that the group of 4 rods that you were in got caught out the most with the bad weather at the start of the trip. As you now know the lodge runs a rotation system designed that everyone gets to fish all the water, rivers and sections. However with the bad weather at the start of the week the rotation had to be changed as plane got stranded and some other customers spent additional nights out at the remote camps. I agree with you it would have been better if there could have been more flexibility in the rotation system for the second half of the week once the weather improved. As with all these things it means there was an imbalance for the week as for some customers the bad weather resulted that they had more fishing at the best locations and others had less. This is something we can certainly look at and talk to the lodge owners. I agree with you about tackle, I think it is a personal thing. Although lots of lodges have rods and reels for customers to use, I always prefer to take and use my own. I think it is worth the little extra hassle to carry it all. I was really pleased to hear that you did overall enjoy the trip and I suppose a testament to that is you wishing to return. Really enjoyed the fishing. Some excellent fly water and interesting to catch such a variety of different species . The lodge was very comfortable and the staff extremely willing to please. Would be great if there was a flight that would go direct to Anchorage, rather than have to change at Seattle, which is really tedious. Only negative note is that some of the guides lacked experience. Paul Thank you for your feedback as it is very important to everyone. I have left you a voice message as I would the opportunity to chat to you now you have returned. I also hope that you got some great pictures. Thank you for your custom and I look forward in helping you again. The seaplane journeys were a real experience. The lodge staff and guides were excellent. The out camps were well set up and comfortable. The food was excellent with a multiple choice at every meal. There was a large variety and numbers of fish Pike , Rainbow Trout, Dolly Varden, Grayling, Jacks, Sockeye, Chum and Kings. I most enjoyed using the double handle rod with skagit head and sink tip. Most of the fish were close to the bank almost at your feet so the fishing was with a lure , split shot,weight and egg imitation. The fish could be seen and were moving past in shoals most of the day. All in all a very good trip and one to be done again. It was nice to talk to you on the phone, so glad you loved the place as it is a real experience. Thank you again for your continued support and custom over the years. Who had never picked a fishing rod up until the day before!!! thanks for calling me back. So glad you both had an amazing time and it turned out to be such a special father and son holiday. As normal thanks for your feedback and custom it is much appreciated. Immigration into the US is a nightmare, which ever port / airport you enter through. Seattle is no exception. It took 1.5 hours but you need to allow plenty of time for connecting flight to Anchorage. Once you get through this nightmare you are then queuing for customs and then for security. Wouldn't allow less than three hours next time. The perception is that Alaska is freezing cold all year round but in July the weather is more akin to Scotland in Summer. Layers are the key. Having said this it was 80 degrees the month before our arrival and a fire ban was in place so covering all bases is the key. As much of the good fishing is accessed by float plane the weather is clearly an important issue. Rain and wind are not so significant but fog is a show stopper. Its Alaska afterall, so weather disruption is a possibility any week and this does cause fishing rotation problems. At BBL you can arrive with literally no gear at all and they will have you fully equipped. This is a real benefit when flying with so many connections as not taking waders, boots etc. cuts down on weight and bulk. All the advice was you have to take hiking boots (if only to get across the infamously muddy Dillingham Airport car park). In reality this is not the case and they are re not needed at all. They take up valuable space and can be left at home. There are only a relatively small number of spey rods available for those who want to fish with double handers as all of the fishing is with single handed rods. The fishing is not just about big salmon in numbers. It is just as much about catching wild rainbows on dries (stunning fun), nymphing for grayling and pursuing other species such as Dollies and Char. Alaska is not Scotland on steroids. Yes there are many more fish, they are bigger fish and there are more species and although the principal and outcome is the same the process is more â€˜industrialâ€™ but we found that the guides were responsive if we said we were not enjoying a particular style of fishing on a particular beat they were more than happy to move on and try something different. Apparently, it is only the British who donâ€™t like using shot on their floating lines but if you want to catch fish then you have to get that fly down! Some of the methods would not suit a true salmon purist ! The only gripe with BBL, (apart from the shower â€“ Every Lodge must have good showers) were the guides. It seemed to be a mix of very experienced guides who had fished the waters for years (the minority) with the majority being â€˜rookieâ€™ guides. They were very experienced guides in their own right but didnâ€™t have the extensive local knowledge one would expect in a destination of this caliber. There was certainly a very strong correlation between guide experience and number of fish caught. Having said this, they were all polite, enthusiastic, friendly and nothing was too much trouble. Overall, it was a great trip with some fantastic fishing, a real experience for the first timer not only in terms of fishing but in terms of seeing amazing wildlife and experiencing something truly different. It was good to catch up on the telephone after your trip and also a huge thank you for such a great detailed customer feedback. There are some great comments and tips in your feedback which are not only useful but also import for both us and the lodge. In relation to the guides as I have mentioned don other customers feedback from this week. There was a problem at the lodge with 2 experienced guides having to leave to receive medical attention as they had hurt themselves. This unfortunately let the new guides under pressure. A point we need to consider with more spare guides incase of emergencies. It was also very pleasing to hear that you also wish to return next year, I will get your paperwork sorted and I am sure that it will give the lodge the opportunity to show you just how much better things are when everything runs smoothly. Thank you for a great holiday and my first trip to Alaska. Both your organisation and that of the lodge staff was excellent. Everyone works hard including the guides who certainly know what they are doing. So a big thanks to everyone. 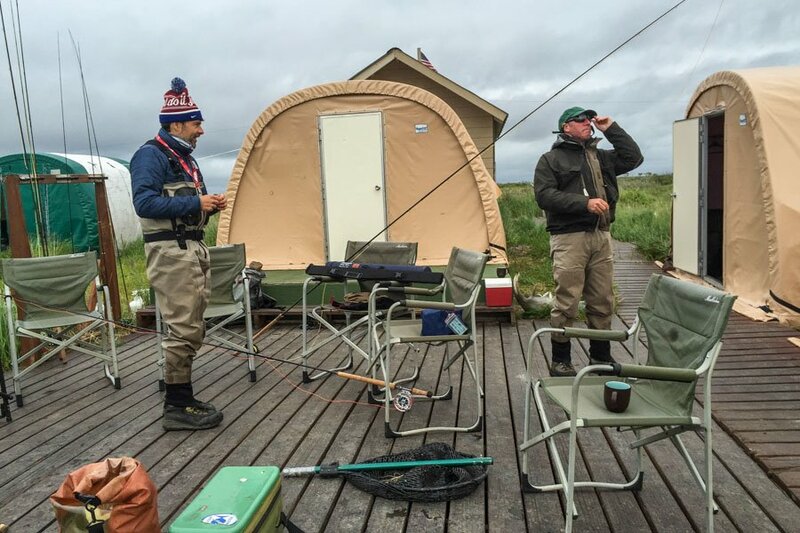 Personally as this was my first trip to Alaska I did prefer the camps to the lodge as it is nice to be able to carry on fishing after dinner and a few drinks. I also found the fishing to be of a better standard at the remote camps. Only points I could mention that was the food was not as high as I expected, there was plenty of it just thought it could of been at a higher standard for a lodge that is considered as one of the best fly fishing lodges in the world. Also areas of the lodge are starting to get a bit tired but I understand this year the lodge is going to have some work completing. Having said that overall I thoroughly enjoyed the whole trip and look forward to anther trip to Alaska soon. Graham, thanks for taking the time to talk to me today in relation to your trip to Alaska, it was nice listening to you talk about the fishing and it was also interesting to listen to your comments. I also personally love the out camps as it feels closer to nature plus the added advantage of being able to fish after dinner. We have had a couple of comments about the food which again I will pass on to the lodge as I am sure Steve and his team will address any issues right away. So I am sorry about that. I know you said the food was ok but just not as high of standard as you expected. In relation to the lodge, yes having anglers pass through on a weekly basis each year does take its toll on the place. Having said that it is now under new ownership and they have a plan to start freshening up areas of the lodge. I am please that over all you thoroughly enjoyed the whole holiday, which shows on the rating you have given it. I look forward in taking care of you again soon personally. Another amazing trip to Bristol Bay Lodge, great company and lots of Salmon. This is my second trip and I will be back for more, there is only one thing I could possibly say on a negative view was, personally I do not think the food at the lodge and one of the camps was to the same standard as the previous year. Having said that all the services runs like clockwork and the guides are excellent and thats what we go for. Thanks for the feedback it was great to talk to you on the phone and glad to hear that you enjoyed your second trip to Bristol bay. Sorry to hear that you did not think the food was of the same standard as the previous year. I will make sure those comments are past on to the lodge. As you know quite often its new chef's at the lodge each year so we will have to see how the current one gets on. I look forward in handling your booking to return next year. Travelling: Started really well with 5 out of 8 upgraded from premium economy to Business. Quite a few missed the connection at Seattle but were on the next plane soon afterwards so caught up. On the way home, 2 people were bumped off the flight for which we had reservations. They were put on the next flight so all ended well. The lodge was great and the fishing was full on, you need a rest once you return. Thanks for taking the time to talk to me about the trip, so glad you loved it, I agree the fishing is full on but thats a good thing. Not sure what went on with Alaska Airlines with the flights as normally they have been spot on. The good thing is that they sorted it and everyone arrived on time. I look forward in receiving some pictures. I will keep you informed about the new group trip to Alaska next year for Kings and Chum. Also if you want to talk about Cuba give me a call when you are free. Fantastic trip great fishing and hospitality I really couldn't fault it. Worth every penny defiantly a trip of a lifetime. It was great talking to you on the phone and glad you agree that the holiday was a trip of a lifetime... However it never tends to be the only one as so many customers including you love to return. Thanks for your continued custom as it is much appreciated. The organisation has to be seen to be believed, I would go back just for the experience. Although the aim of my trip was to target the Kings the other fishing available did sway me away on some days, after all who could refuse the huge rainbows. Thanks Peter I took a little persuading but boy am I glad I listened. Another amazing trip this time we fished for the Silvers, the shear numbers of fish was mind blowing. Along with Dollys, Graylings and Char. The char shore lunch was excellent. These guys run a top notch operation. Steve Laurent does a great job making every guest feel at home and the pilots and guides all want you to be successful and have a great journey. I saw moose, caribou, eagles, and a bear or too. It was a blast! Transfers, fishing, guides and accommodation all first class could not fault. A dream trip door to door. Only negative point is the flight connections are long but I know you can not do anything about it.